Designed specifically for side-by-sides, the Kanati Mongrel is an innovative, lightweight tire derived from the Kanati Mud Hog™s tread pattern. 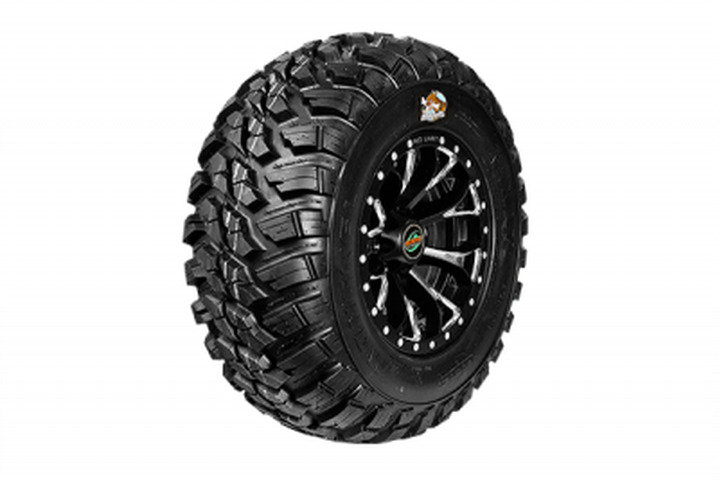 Exceptional off-road capabilities with high-void, self-cleaning tread and 8-ply DOT-approved radial construction for street-legal use. Available in five sizes. Much like the light truck version, the Kanati Mongrel™s tread is optimized for peak performance on multiple surfaces. The Mongrel can handle a variety of off-road terrain while remaining equally safe and suitable for paved surfaces. The 8-ply, DOT approved radial also boasts an impressive 1,000 lb. load rating and an equally impressive 87 MPH N speed rating. Purchase includes the Kanati Mongrel tire only. The wheel rim shown in the picture is not included. Picture provided is a stock picture from the manufacturer and may or may not reflect the actual product being ordered. All Kanati Mongrel tires are continuously developing with manufactured improvements. With that said, Simple Tire and the manufacturers have the right to change these tire specifications at any time without notice or obligation. Please Note: Specifications of the Kanati Mongrel tires shown above are listed to be as accurate as possible based on the information provided to us by Kanati tires. Quick hassle free delivery. Great service. Couldn't be better. This is my 3rd set of these tires and other than 1 sidewall getting damaged they have been a great tire in all terrains. As for Simple Tire, you will have a hard time beating their prices and customer service. I had an issue with this order where they sent me 1 wrong tire out of the set of 4 but Kristin took care of this very quickly and professionally. Would recommend Simple Tires to anyone.